Amazon FreeRTOS is an operating system for the microcontrollers that power connected devices such as appliances, fitness trackers, industrial sensors, smart utility meters, security systems, and the like. 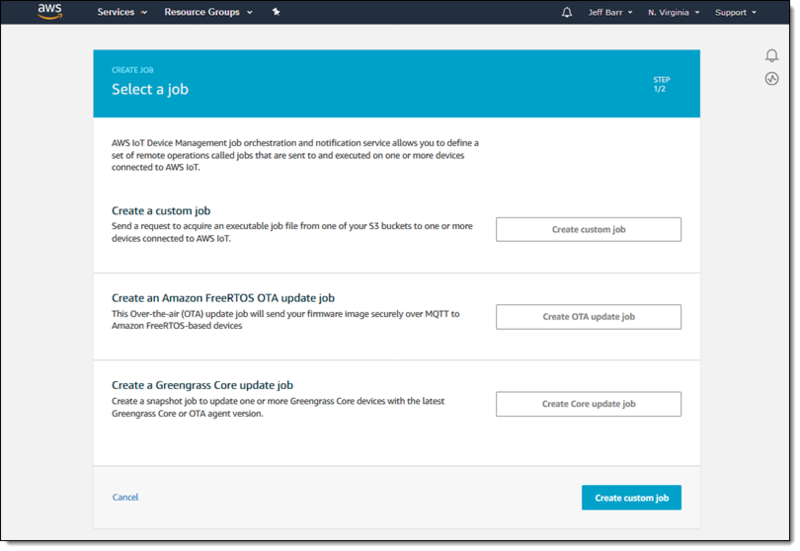 Designed for use in small, low-powered devices, Amazon FreeRTOS extends the FreeRTOS kernel with libraries for communication with cloud services such as AWS IoT Core and with more powerful edge devices that are running AWS Greengrass (to learn more, read Announcing Amazon FreeRTOS – Enabling Billions of Devices to Securely Benefit from the Cloud). Unlike more powerful, general-purpose computers that include generous amounts of local memory and storage, and the ability to load and run code on demand, microcontrollers are often driven by firmware that is loaded at the factory and then updated with bug fixes and new features from time to time over the life of the device. While some devices are able to accept updates in the field and while they are running, others must be disconnected, removed from service, and updated manually. This can be disruptive, inconvenient, and expensive, not to mention time-consuming. As usual, we want to provide a better solution for our customers! Security – Updates can be signed by an integrated code signer, streamed to the target device across a TLS-protected connection, and then verified on the target device in order to guard against corrupt, unauthorized, fraudulent updates. Fault Tolerance – In order to guard against failed updates that can result in a useless, “bricked” device, the update process is resilient and able to handle partial updates from taking effect, leaving the device in an operable state. 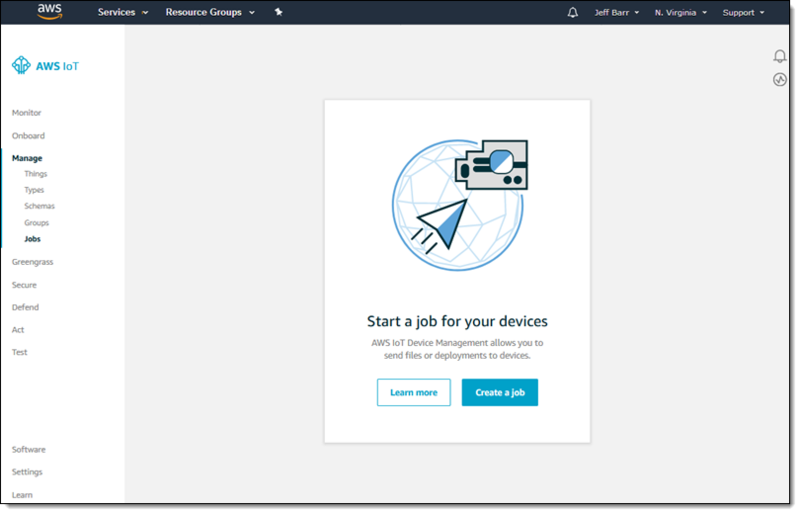 Scalability – Device fleets often contain thousands or millions of devices, and can be divided into groups for updating purposes, powered by AWS IoT Device Management. Frugality – Microcontrollers have limited amounts of RAM (often 128KB or so) and compute power. Amazon FreeRTOS makes the most of these scarce resources by using a single TLS connection for updates and other AWS IoT Core communication, and by using the lightweight MQTT protocol. Each device must include the OTA Updates Library. This library contains an agent that listens for update jobs and supervises the update process. I don’t happen to have a fleet of devices deployed, so I’ll have to limit this post to the highlights and direct you to the OTA Tutorial for more info. Each update takes the form of an AWS IoT job. A job specifies a list of target devices (things and/or thing groups) and references a job document that describes the operations to be performed on each target. The job document, in turn, points to the code or data to be deployed for the update, and specifies the desired code signing option. Code signing ensures that the deployed content is genuine; you can sign the content yourself ahead of time or request that it be done as part of the job. Jobs can be run once (a snapshot job), or whenever a change is detected in a target (a continuous job). 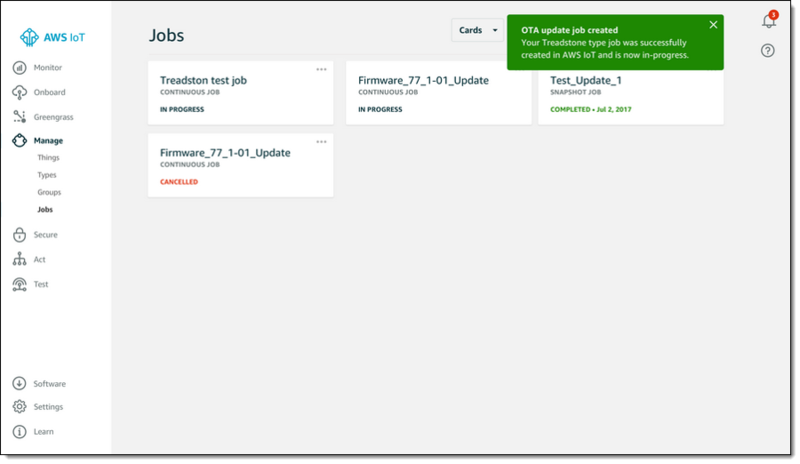 Continuous jobs can be used to onboard or upgrade new devices as they are added to a thing group. After the job has been created, AWS IoT will publish an OTA job message via MQTT. 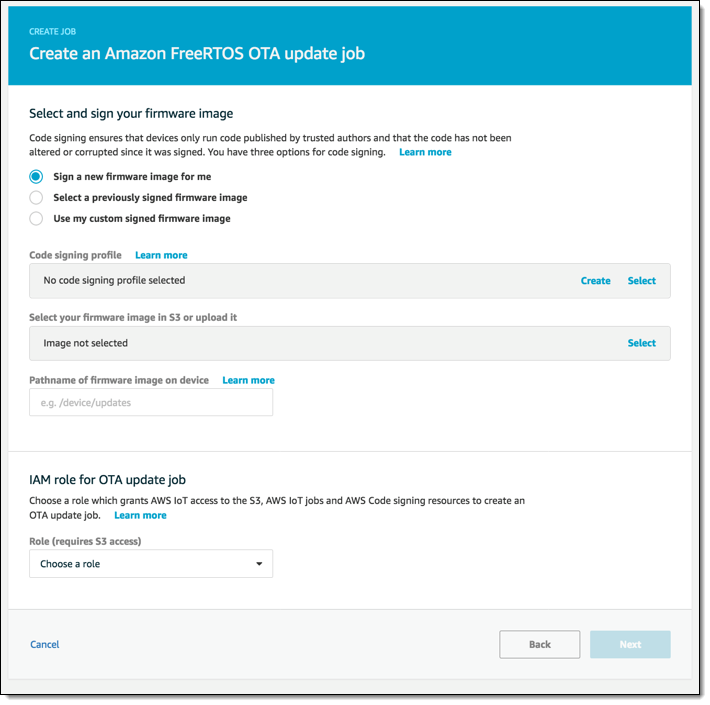 The OTA Updates library will download the signed content in streaming fashion, supervise the update, and report status back to AWS IoT. Again, to learn more, check out the tutorial. This new feature is available now and you can start using it today.